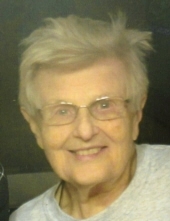 Mrs. Emily Tannel, formerly of Cedarburg and Port Washington, passed away at her residence in West Bend April 7, 2019. She was 90 years old. Emily was born in Ontario, Canada on January 3, 1929, daughter of Henry and Amelia Strutcha Lukas. She grew up in Ahmerstburg, Ontario and attended local schools. She received her nursing degree from Hotel Dieu Hospital in Kingston, Ontario in 1951. At her cousin’s wedding she met the groom’s brother, Basil “Buz” Tannel; on November 26, 1955 they were united in marriage in Chicago, IL. The couple later moved to Port Washington before building a home in Cedarburg. Mrs. Tannel worked as a nurse at St. Joseph Hospital in West Bend as well as St. Alphonsus Hospital in Port Washington before moving into geriatric nursing. She later worked at Mequon Care Center and Lasata Care Center. In 1991, Emily and Buz moved back to Port Washington, and Emily later took a job at Exacto Spring in her retirement years. Buz preceded her in death in 2006. Mrs. Tannel was a member of St. John XXIII Parish in Port Washington, and a former member of St. Francis Borgia Parish in Cedarburg. She enjoyed working jigsaw puzzles, listening to the Milwaukee Brewers and watching the Green Bay Packers. She is survived by her children Greg (Debbie) Tannel of CO, Vince (Annette) Tannel of CO, Mike (Susan) Tannel of West Bend and Mary Kay Bryan of TX. She is further survived by 17 grandchildren, 6 great-grandchildren, other family and friends. Emily is preceded in death by her husband, son Richard, grandson Aaron and sister Mary. A Requiem Tridentine Mass will be held at 11:30AM on Friday, April 12 at St. Francis Borgia Catholic Church – South, N44W6055 Hamilton Rd., Cedarburg. Canon Benoit Jayr will preside the Latin Mass. Emily will be laid to rest beside her husband in the parish cemetery immediately following the service. The family will receive visitors at the SOUTH CHURCH on Friday from 10:30AM until Mass 11:30AM. In lieu of flowers, masses said for Emily are requested. The Eernisse Funeral Home is assisting the family with arrangements; online condolences may be left at www.eernissefuneralhome.com . To send flowers or a remembrance gift to the family of Emily L. Tannel, please visit our Tribute Store. "Email Address" would like to share the life celebration of Emily L. Tannel. Click on the "link" to go to share a favorite memory or leave a condolence message for the family.